Is This The Name Of Ferrari’s New Hybrid Supercar? Specifications for Ferrari’s new hybrid supercar have also been potentially confirmed. All eyes were on the F8 Tributo at this year’s Geneva Motor Show, but Ferrari still has four new models left to reveal this year. The first will be the automaker’s long-rumored hybrid supercar, which will break cover in just a few months. Camouflaged prototypes have already been caught out in the wild, but details about Ferrari’s new hybrid supercar have been scarce – until now. According to Car magazine, Ferrari’s new V6 hybrid powerplant will debut in May and will power several new models. 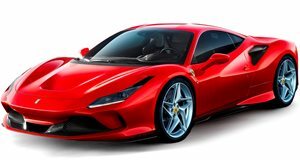 Under the hood, Ferrari’s new hybrid supercar will allegedly be powered by the same twin-turbo, 2.9-liter V6 used in the Alfa Romeo Giulia and Stelvio Quadrifoglio, but mechanical tweaks and an electric motor will increase the output from 505 hp and 443 lb-ft of torque in the range-topping Alfas to around 723 horsepower and 800 lb-ft of torque. Being just under 3.0 liters also means Ferrari will avoid being charged extra taxes in China, which is a major market for the manufacturer. According to Car, Ferrari’s new hybrid supercar will be called the 486. Previous reports have suggested Ferrari intends to revive the Dino name, but this is likely to be a smaller sports car with a lower power output than the 486. Ferrari’s Senior Vice President of Commercial and Marketing, Enrico Galliera, recently confirmed this model will be designed "more for everyday driving." In terms of styling, recent spy shots have suggested the 486 will be based on the 488 GTB, but this could have been a test mule. In the future, Ferrari has already confirmed the upcoming Purosangue crossover will be available as a hybrid, so it might also get a version of the automaker’s new electrified V6. As for the other remaining models Ferrari has in the pipeline, rumors suggest a convertible 812 Superfast could be coming this year.